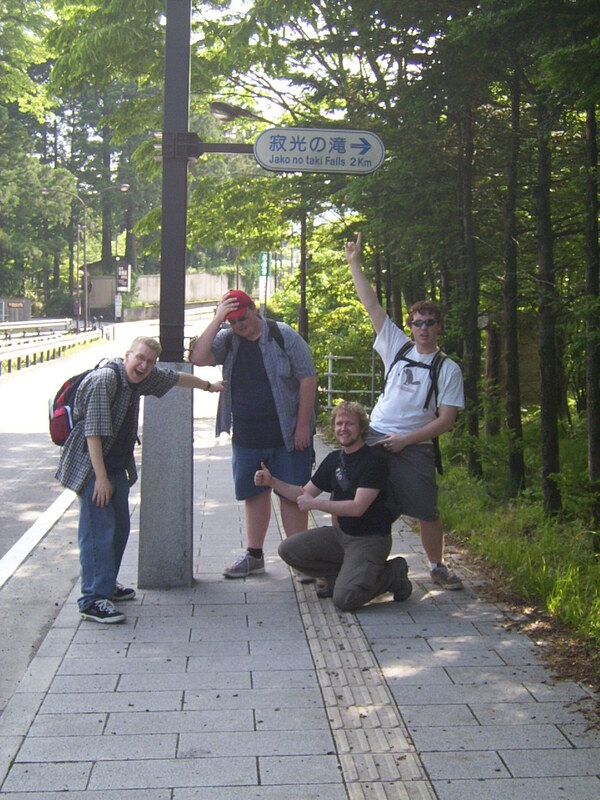 After visiting some of the man made attractions in Nikko, we decided to visit some of the natural attractions. 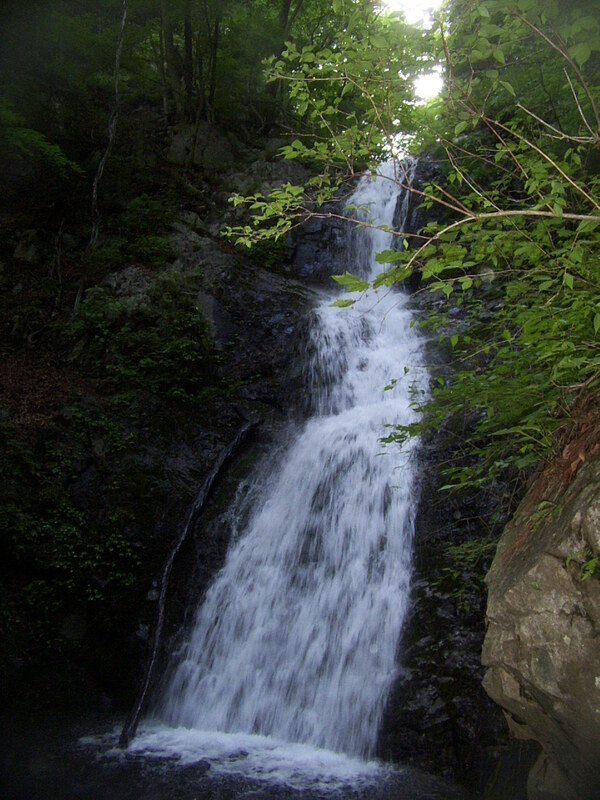 The Nikko area is famous for waterfalls. There are many famous falls in the area, but we decided on Jakko Falls because it was one of the closest to our current location. It looked pretty close in Flounder’s lonely planet guidebook, but the distance was actually 3.5km from Tosho-gu. We started walking along the road, noticing that we were starting to walk slightly uphill. With only Lonely planet as our guide, we missed a turn and started to second guess our route. Some road signs were misleading and we ended up making a few small circles before finally finding a sign for Jakko falls showing that we still had 2km to go. We were all tired by this point, but decided that we weren’t going to go back until we found waterfalls. We turned off the main road and started walking up a narrow road towards the falls, this time at a much steeper angle. Code Red, Hippie, Green and I were doing reasonably well with all the walking, but big Flounder was continuously falling behind. Every five minutes or so we would stop, have a nice cool drink, and wait for Flounder to catch up to us. When he caught up we would start walking again. This was great for us, but the one person who really needed to take a break was walking continuously. Our 2km walk included a 300m vertical climb. By the time we got to the falls, we were all sweaty and tired. The falls were impressive, and we all had a nice relaxing rest near the bottom while getting splashed with cool mist. There are likely more impressive waterfalls in the world, or even in the area, but after all the walking we truly appreciated Jakko falls. We earned our view. After a break we started our 5.2km walk back to the station, which thankfully was downhill the entire way. We walked back towards the main road in great spirits, singing Weezer songs at the top of our lungs and listening to them bounce off the nearby mountains. My apologies to the few houses in the area for our impromptu musical performance. By the time we got back to the station we had walked a total of 11.5km, not counting our walking around at Tosho-gu or our time getting lost while searching for Jakko falls. I think we all slept on the train back towards Tokyo. Special Bonus Story: On the last leg of our trip home, Flounder started to let us know that he needed a bathroom break, and it wasn’t something that could be dealt with in a standing position. Most train stations in Japan only have the terrifying squat style toilets. I asked him to describe his level of distress on a scale of 1 to 10, and he answered 7. I tried to convince him that he could make it all the way back to Hello House. A few minutes later the distress level had skipped 8 and was now firmly at 9. Getting back to Hello House and its safe conventional toilet was no longer an option. After getting some basic instructions on how to use the squat toilet and which train to take to Noborito, Flounder rushed off the train somewhere on the Odakyu line to find a washroom. We got back to Hello House, both laughing at Flounder’s situation and worried that he would get lost somewhere in Tokyo never to be seen again. About 15 minutes later he showed up, smiling and relived. We all excitedly asked him about his brave experience using a squat toilet. His response: “Bullseye”. (2014 Update 1) Always wear comfortable shoes when sightseeing in Japan. You will always end up walking more than you expected. Having a device with a GPS is also incredibly helpful. (2014 Update 2) It took me another year before I finally had to use a squat toilet in Japan. I have already written up the post. Trust me – it’s going to be a good one. This entry was posted on June 13, 2014, 8:00 pm and is filed under Shenanigans, Team Awesome Sauce. You can follow any responses to this entry through RSS 2.0. You can leave a response, or trackback from your own site.